President Obama has nominated Ted Osius for U.S. Ambassador to Vietnam. 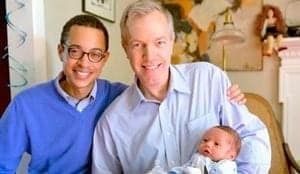 …A known gay politician, Osius is now married to Clayton Bond, who is an officer with the US Department of State’s Bureau of African Affairs. Ted Osius, a career member of the Foreign Service, Class of Minister-Counselor, is an Associate Professor at the National War College, a position he has held since 2013. He was a Senior Fellow at the Center for Strategic and International Studies from 2012 to 2013. Prior to that, Mr. Osius served as Deputy Chief of Mission at the U.S. Embassy in Jakarta, Indonesia, from 2009 to 2012. Before that, he was Political Minister-Counselor at the U.S. Embassy in New Delhi, India from 2006 to 2009. Mr. Osius also served as Deputy Director of the Office of Korean Affairs in the Bureau of East Asian and Pacific Affairs at the Department of State from 2004 to 2006. Prior to that, he was Regional Environment Officer at the U.S. Embassy in Bangkok, Thailand from 2001 to 2004. From 1998 to 2001, he was Senior Advisor on International Affairs in the Office of the Vice President at the White House. He served as Political Officer at the U.S. Consulate General in Ho Chi Minh City and at the U.S. Embassy in Hanoi, Vietnam from 1997 to 2001. Other positions he has held include: Staff Aide and Political Officer at the United States Mission to the United Nations, Political and Management Officer at the U.S. Embassy in Vatican City, The Holy See, and Political and Consular Officer at the U.S. Embassy in Manila, Philippines. From 1985 to 1987, he was a Legislative Correspondent in the Office of U.S. Senator Al Gore, Jr. Mr. Osius received an A.B. from Harvard College and an M.S. from the School of Advanced International Studies at The Johns Hopkins University.